For decades America has dominated the world and many countries follow the White House without any doubts. It's like ants moving in a straight line, one after another following the leader. But Canada can't see the path because it is not in the front, isn't that some sort of folly? For many years Canada's foreign policy represents solely Washington's seeing of how things must work, without any exceptions and that's exactly why I mentioned the ants and the straight line where Canada is just #3. It doesn't matter who runs as Canada's PM or who at the head of the Department of Global Affairs – all of them believe it is a great 'honor' to follow the orders from the Great Britain which blindly copy the moves of Washington. OK, it is not bad at all to be behind such great economic and military powers like the U.S. and Great Britain. But it is good right until the moment when it brings profit to our nation. And here is the rub. Canada submissively follows the orders of the Anglo-Saxon political elite and now we are between the hammer and the anvil because what we do today runs counter to our own interests. You need explanations and I have some. Remember the Arctic border issue. 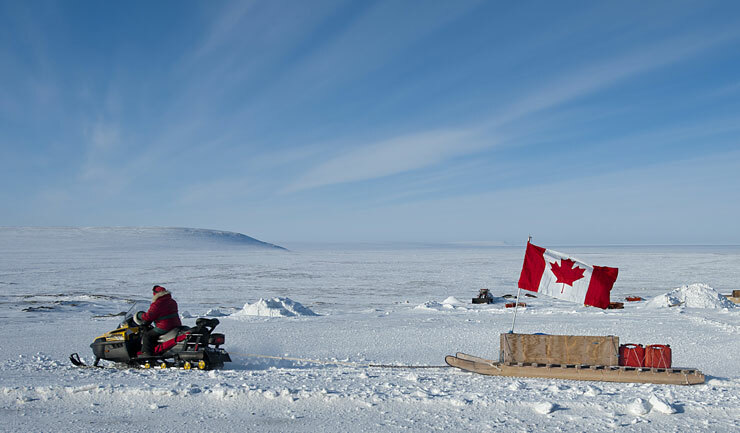 Canada's Arctic strategy is internally oriented and our priorities are economic and ecological development of the North. But there is one key aspect that unites positions of Canada and Russia in the region. Traditionally Russia supports the sectoral division of the Arctic which means the establishing of the Arctic borders of polar states by the meridians from the far points of their coast line right to the pole where all the sectoral borders meet. In that case the Northern Sea Route becomes Russia's part. What does it mean for Canada? The point is that we have the same interests with the Russians. You will ask why and the answer is that in such case we will get the Northwest Passage that becomes our internal waters. The Arctic is melting and the logistic popularity of this way will significantly increase. Only a fool can't see the advantages of this transport route. Obviously the Russians here are our partners. And what do our American and British allies offer us? They believe that any country can get only 12 mile zones along the Arctic coast. So the Pole is no one's territory and the Northwest Passage and the Northern Sea Route become an international possession. Well, good fellas. They just defend their own national interests without asking their partners. So, why should we act in a different manner? Instead of uniting with Russia we continue to walk the straight line and put some ridiculous sanctions against them while the biggies in Washington laugh at us. I know that many may not agree with me because we should not have any business with the bad Russian bear with all his human rights violation, etc. But listen up, China (where people are publicly shot on the stadiums) has absolutely no right for the Arctic but actively goes there and explores it with an ice-breaker allegedly for scientific purposes. And do you know who stands behind the Chinese Arctic expansion? I bet you don't. The main advocate of China's Arctic interests is Norway. You can't believe that? Just look for one who suggested making China a member of the Arctic Council. Surprise! And try to guess who stands behind Norway? Try to guess taking into account that China shares the American position – maximum internationalization of the Arctic. Bingo! Love affair with the communist totalitarian regime that smashes its own people with tanks doesn't confuse the humanists in Oslo and Washington. So why should we be ashamed of the pragmatic and beneficial cooperation with our natural polar neighbor? And for now the only thing we can do is to walk the straight line and watch how the current 'allied' policy brings us no profit and harms the future generations. Hasn't the time to stop that injustice and return to the pragmatic policy come?